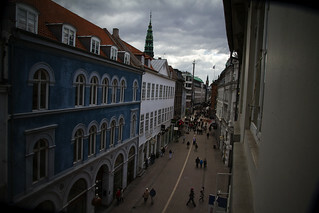 Copenhagen's famous pedestrian street "Strøget" turns 50 on September 2, 2012. There will be festivities up and down the street in celebration. Here's a post that shows the origins of the idea can be found in 1913. Originally published on 11 August 2009. 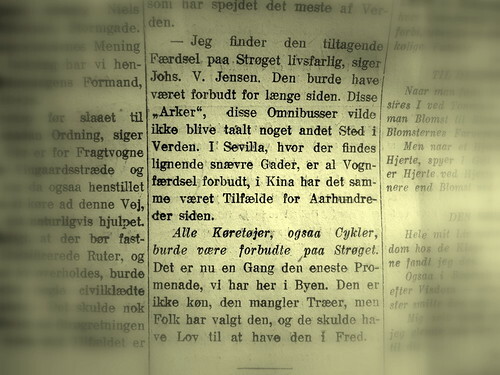 I dipped into the archives the other day and found an interesting article from 1913 about traffic on the main thoroughfare in Copenhagen - 'Strøget'. In the early 1960's Strøget, the main street running east-west through the city centre, became quite famous. It was closed off to cars and transformed into a pedestrian zone. Strøget 1951 and in 1964. There were protests back then. Cries of "we're not Italians! We don't want to walk!" were heard in the city. Shopkeepers feared for their businesses. Fortunately, the idea was implemented by the City of Copenhagen. They had seen some of the great ideas by urban planner Jan Gehl. This was a turning point in the modern life of Copenhagen. 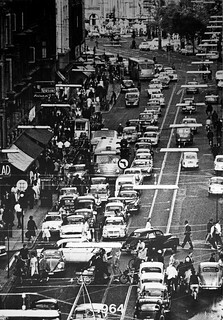 Cars were taking over, fewer people were cycling and the city was congested and polluted. Visionary political decision-making and urban planning was needed and it arrived. Since then, Copenhagen hasn't looked back. The fears of the shopkeepers were soon allayed - indeed there is nowhere in the world where pedestrian zones or bike lanes have caused commerce to suffer. These two urban planning instruments only serve to increase the number of pedestrians and act as a form of traffic calming. Streets become, quite simply, nicer places to be. I was suprised, however, to discover that a well-known Danish writer Johannes V. Jensen was quite a visionary. 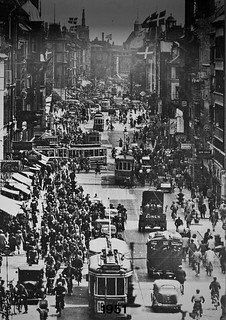 In the article I found there was a discussion about the increasing traffic on Strøget back in 1913. 'Omnibusses' had made their debut and motor traffic was on the rise. The city's backbone was under threat. Various personalities were asked about what should be done about the street. Should bikes be banned? What about pedestrians? Should cars and omnibusses prevail? "I find the increasing traffic on Strøget extremely dangerous, says Johannes V. Jensen. It should have been banned ages ago. These "arks", these omnibusses wouldn't be tolerated anywhere else in the world. In Seville, where there are similar narrow, winding streets, all traffic is banned. In China it's been like that for centuries. All vehicles, including bicycles, should be banned from Strøget. It's the only promenade we have in the city. It isn't pretty, it needs more trees, but the people have made their choice and it should be allowed to exist in peace." Strøget's transformation was a success. To this day it is only for pedestrians and the network of pedestrian streets in the centre of the city has expanded, along with Shared Space stretches and traffic calming measures. Johannes V. Jensen was, indeed, quite the visionary. Unfortunately, he died in 1950 so he didn't get to see it happen. She cycles over Knippel's Bridge each day to work and Jensen has several lovely passages that describe cycling in Copenhagen. There is another passage that I can't seem to find in my notes about how the cycling girls of Copenhagen are all blonde and they make you think that they are all members of the same family. The 'cycling girl' as a cultural icon in Danish history lives on, as does Johannes V. Jensen's vision of a car-free city centre.